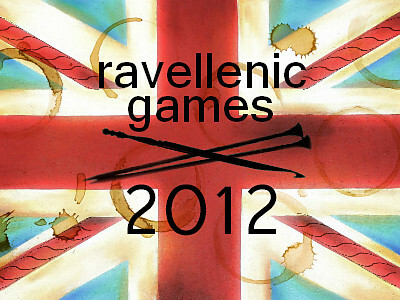 The Ravellenic Games are now less than 24 hours away at time of this blog post. I’m not frantic (yet). Actually, I have to say that I’m calmly prepared for these games, this time around. I’ve got my patterns picked and printed out, needles and stash yarn (yeah for stash busting) at the ready, and I’m just waiting for 1300 hours tomorrow to cast on and begin the process of hopefully finishing these two projects in 17 days. Go Team Canada! 1. Gooseberry Baby Hat (Ravelry link only). Its a really cute baby hat knit in sport weight on 3.5mm needles. Should be a breeze to knit, and its going to be a gift for my coworker Jen C., who’s expecting her first baby in September (a boy). This hat has been entered in the following events: “event baby,” “event hats,” “event stash” (for stash busting). 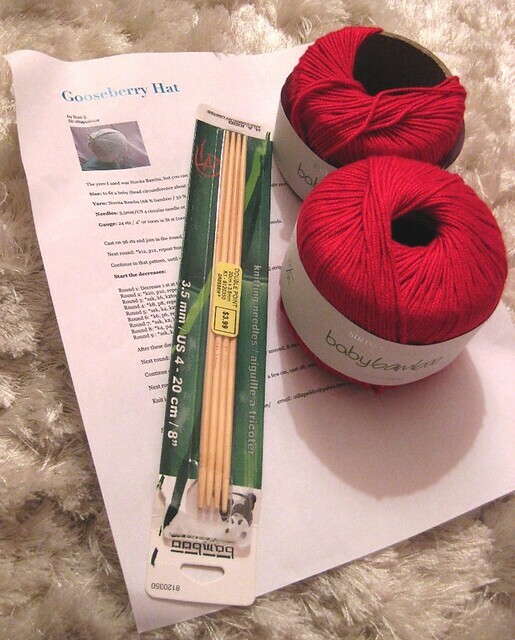 I’m using up some lovely Snuggly Baby Bamboo in a bright red colour. Lovely lacy socks for me because I haven’t made a pair of handknit socks for myself in forever. The pattern says that they are knit from the cuff-down and in the round on 2.25mm needles. I don’t think I have DPNs in this size, but I do have some circular needles that I may use to try doing the magic loop method with these socks. I’m trying to become more comfortable with the magic loop method as one day I want to learn and master 2-at-a-time-toe-up socks. Several of my knitter friends are accomplished in this method for knitting socks, and its about damn time I learn it and master it. I do love sock knitting so! The yarn is Regia Stretch Colour. 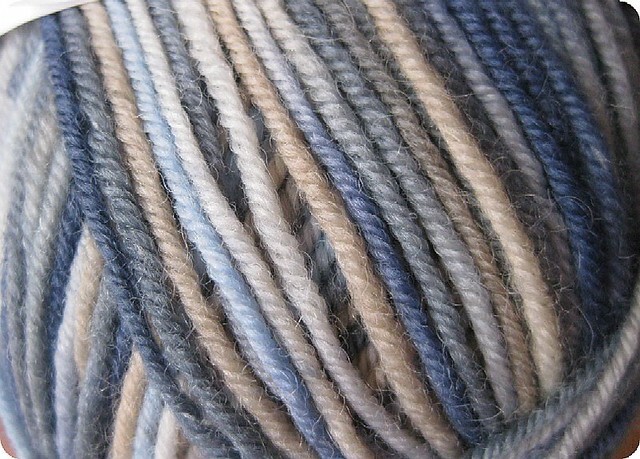 No colourway name, but I think it looks a bit like beachy sand and surf colours. Very pretty, and Regia sock yarns wear like iron. I will have these socks for a long time. I’m heading down the Oregon coast this weekend with my mom, so I’m sure to get a fair amount of knitting done on both projects in the car. Yippee! 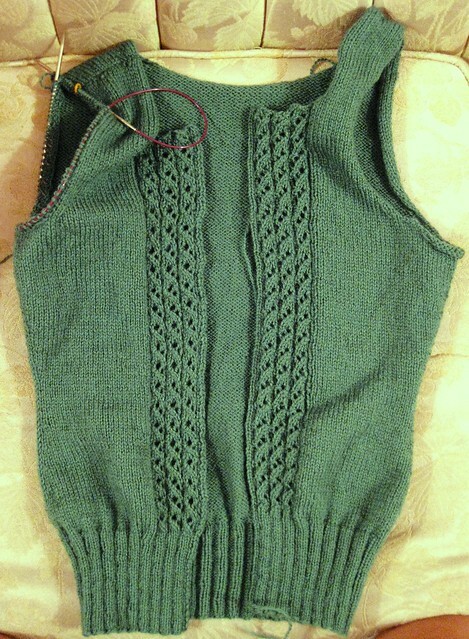 In other news, I’m sort of stalled on my Emelie Cardigan. I was doing so well until I had some back pain (curses) and then problems with the pattern. I had knit to the shoulders and did the 3 needle bindoff to make the shoulder seam more durable (and to avoid the dreaded seaming) and was about to pick up stitches for the sleeves, when I noticed that something seemed a bit off. I had bound off (BO) 11 stitches under each arm, and the pattern was telling me to pick up 25 stitches on either side of the shoulder seam + the 11 stitches and that should = 65. Well I don’t know about you, but in my world, 11 + 50 does NOT equal 65. I had a few other people take a look at it, and they couldn’t make heads or tails of it either. Go figure. I ended up picking up about 72 stitches, and then tried to decrease down to 65 on the next round, but it still seems a bit gape-y for my liking. I’m thinking to put this project down and just focus on the Ravellenic Games over the next 17 days instead. Better to just chill out and come back with a fresh mind, methinks. Note: the cardi is MUCH greener in real life. § 2 Responses to On your mark!" Do we get to see Ravellenics progress on Sunday? I hope to post a new blog posting tomorrow to show my status update as per my Facebook yesterday. You are currently reading On your mark! at When Gaia Smiles.